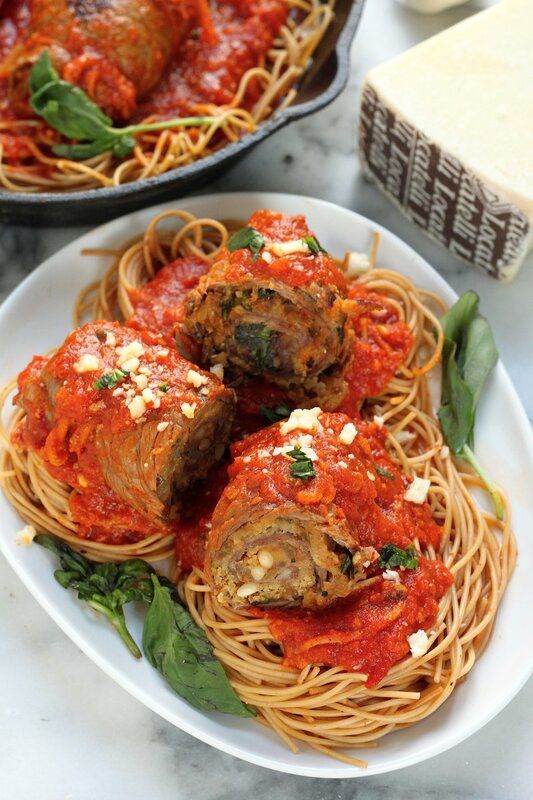 This Sicilian Braciole recipe has been in my family for generations!!! So tender, flavorful, and perfect for Sunday night dinner. If you love Italian food, you have to try this! A trip to Italy is in the works. And for once… not just in my mind. Next month C and I are flying to Sicily, and then – Rome! Please hold while I pinch myself. We’re both so excited for this trip, and of course, all the FOOD! I would seriously marry Italian food. ..If, ya know, marrying food was a thing and all. Since it’s not a thing, I’ll just have to funnel all of my love into this new little series: Sunday Suppers. 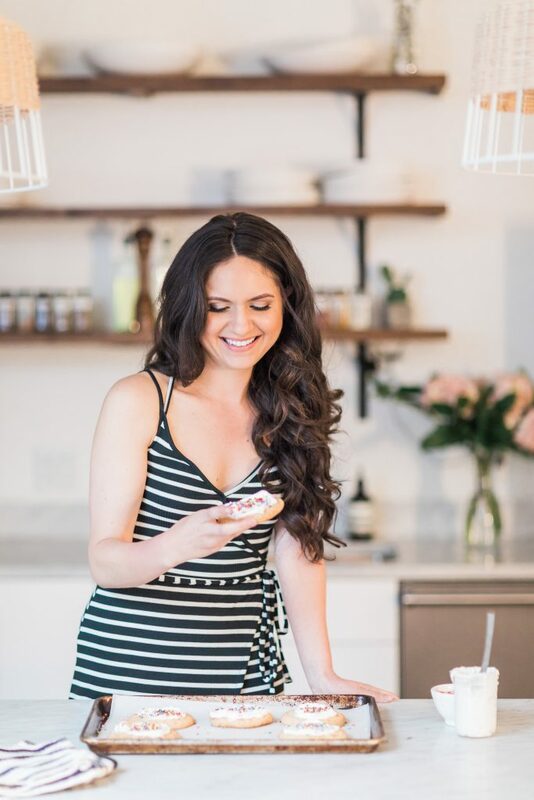 A series where – on Sundays – I will be taking a break from the sweets to share with you some of our favorite cozy supper recipes. Many will be tried and true classics, with a few fun, funkier dishes in the mix. We’ll keep it interesting – I promise 🙂 And if there’s anything you’d like to see, feel free to shout it out! 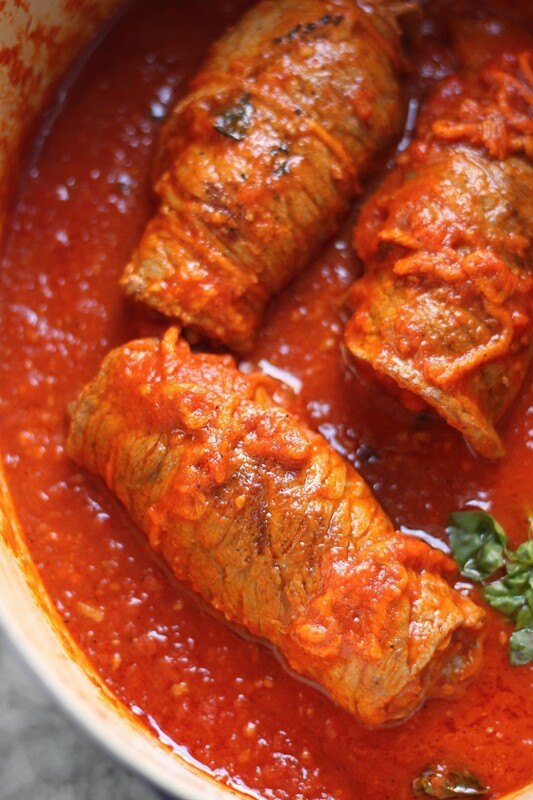 Today we have a classic Sicilian dish, and Sunday staple over here in our house – braciole. I mean… BRACIOLE! Just typing that word gets me all excited. Are you familiar with this amazing meal? If not, here’s a quick what’s what on the dish. 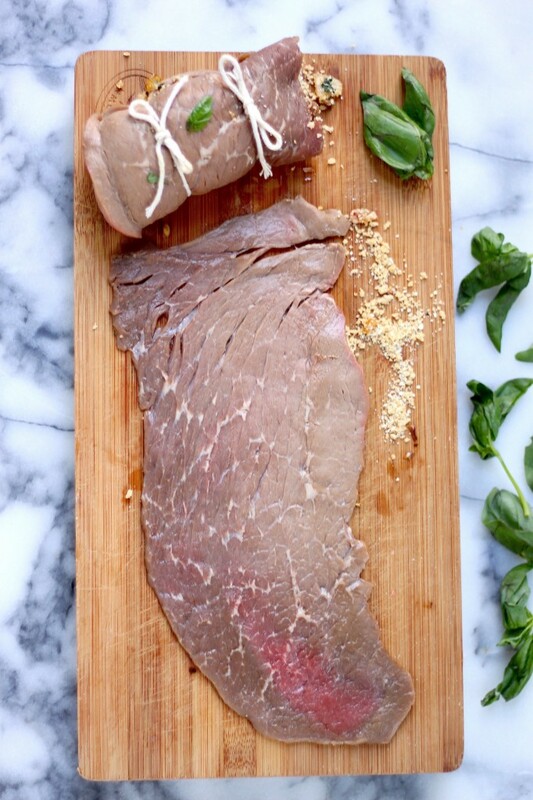 Braciole is a very lean cutlet of beef tenderized by many, many, maaaaaaany smashes from a heavy meat mallet. You can do this yourself, ask your butcher to do it for you, or keep an eye out for it pre-packed in the meat department. Just make sure it’s niiiiice and thin. That’s how it tastes like heaven! Once you have your meat all set and ready, the real fun begins! It’s time for the FILLING! The filling is what really takes this meat from good to great. Different regions have slightly different fillings when it comes to this dish, but for this recipe I choose to stick with what I was raised on, and also what I just find to be the perfect fit. I will say though, some folks choose to add prosciutto to their braciole, and it is super delicious. But only with good prosciutto (the cheap kind is too salty and chewy and doesn’t do justice), which can be mega pricey, and thus, is kind of a turn off. 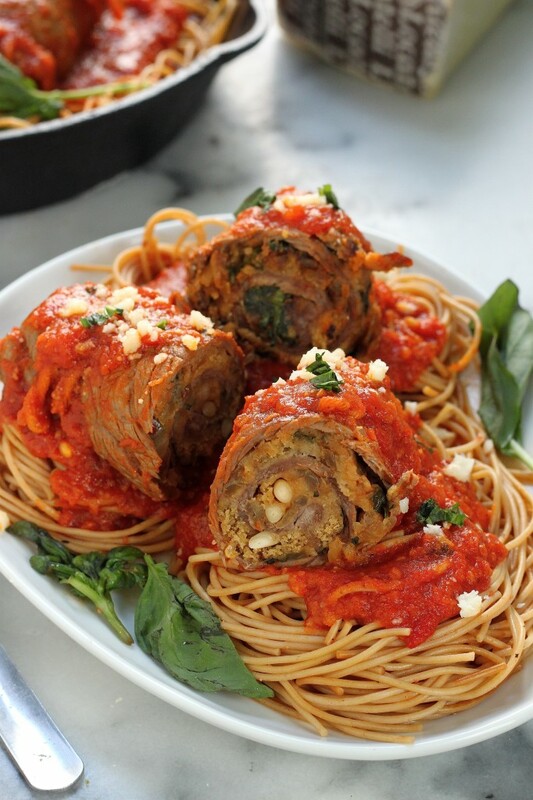 Braciole is very moderately priced, and hearty, so that being said, feel free to add the prosciutto if you want a little salty kick and don’t mind spending a little extra on the meal. It’s going to be lovely either way. The nonnegotiable fillings are sautéed onion, fresh parsley, fresh basil, lots of garlic, pine nuts, bread crumbs, and parmesan cheese. You need them all! And you’ll want them all, too. They add the dreamiest flavor and texture to these rolls, and skipping even just one of them throughs the recipe off a bit. Once the meat has been covered with the stuffing, you’re going to roll the meat up SUPER tight. You want it solid as rock. Making sure it’s rolled as tightly as possible and secure is an important part. If you don’t roll it properly, you’ll lose all your precious fillings! So roll it right. Roll it right, roll it tight! Now that they’re all rolled and ready, it’s time to go down to browning town. 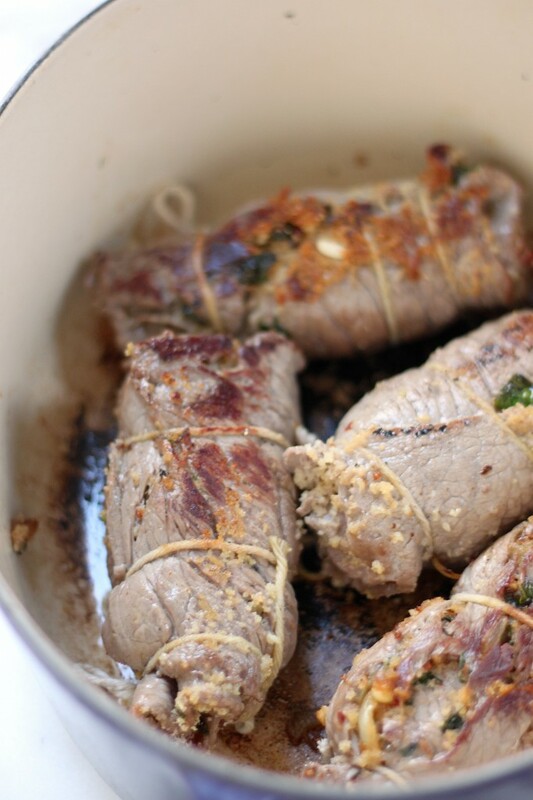 Browning is important for the flavor and texture of the braciole. You want high heat here because you don’t want to cook it! You just want to brown the meat on all sides – including the ends. Since the meat is thin, this will happen quickly. Once it’s nice and golden, it’s sauce time! I used our classic marinara sauce, and totally think you should too 😉 But jar sauce will work if you’re really in a pinch. I love this one from Victoria Fine Foods; it’s all natural and full of flavor! 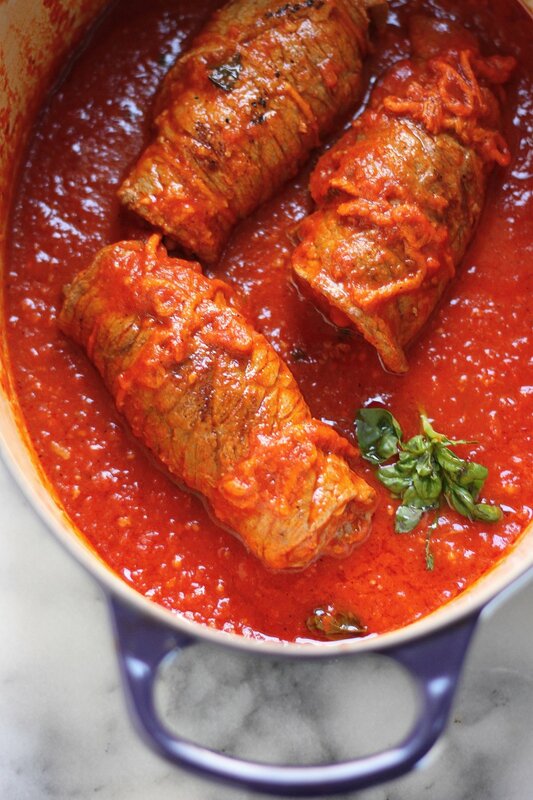 This is by far the easiest part of the job, because all you need to do is pour the marinara sauce on top of the braciole, reduce the heat, and let it simmer away… for 4 hours. Ok. So maybe this is actually the hardest part?! Waiting for 4 hours is hard. But so, so worth it, friends. This is where the braciole soaks up so much flavor and moisture and leaves you with a dish you’ll want to make over and over and over again. When the braciole has been cooking for 3.5 hours, you can boil your pasta! I always use spaghetti when I’m making this, but you can absolutely play around with your noodles here. I chose whole wheat this time because we’re trying to be (a little) healthier but still like (read: need) real noodles. 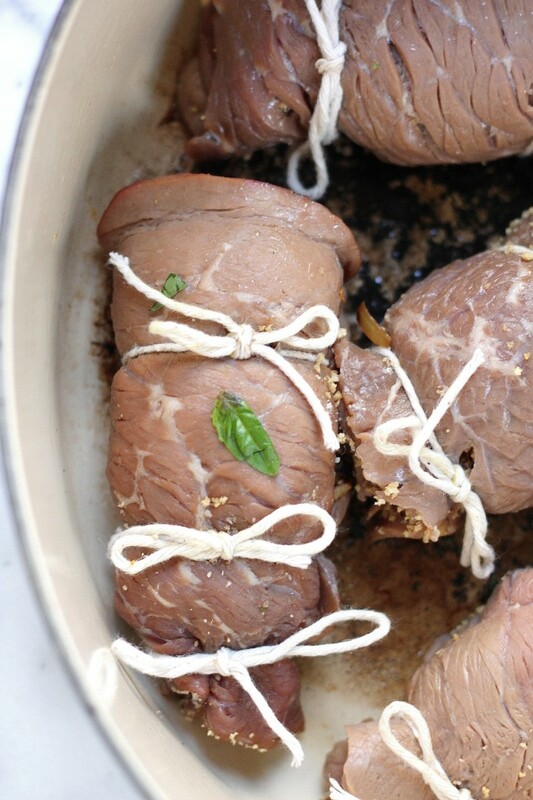 Be sure to remove the string on the braciole before serving! No one wants string on their meat, and it’s best to cut them off “behind closed doors”, since seeing string on your food can be weird for some people, and even weirder seeing you with your kitchen shears cutting away. Stir the first 5 ingredients together in a medium bowl, mix until well combined. Stir in 2 tablespoons of the olive oil. 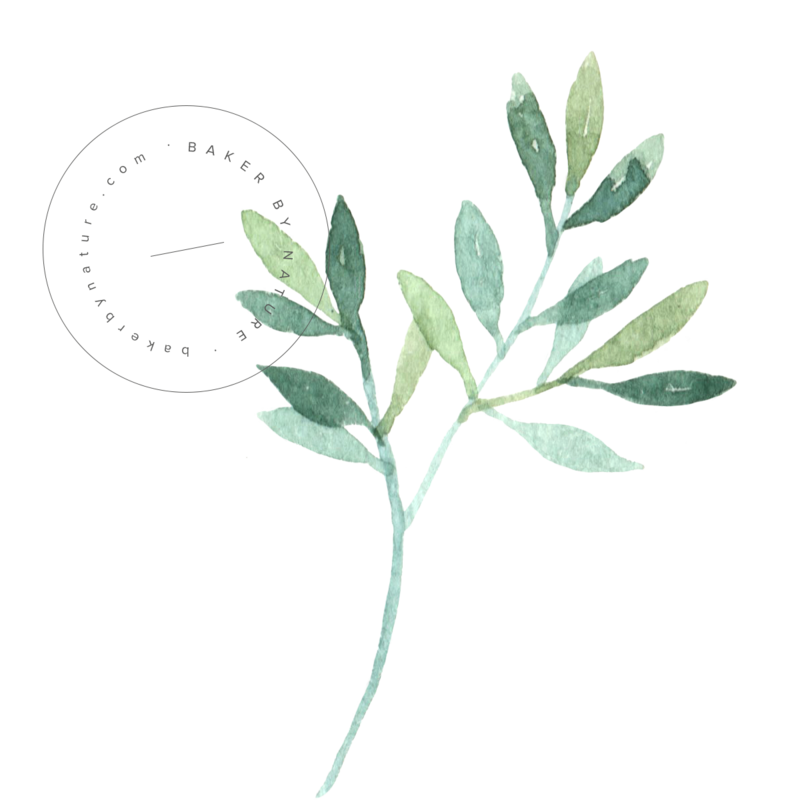 Season mixture with salt and pepper; set aside. Heat a large skillet over medium-heat. Add one tablespoon of olive oil, then add onion and sauté for 4-5 minutes. Add garlic and crushed red pepper, and cook for another minute. Turn heat off and stir in basil. Season with salt and pepper. Combine the bread crumb mixture with the onion mixture, stirring well to combine. 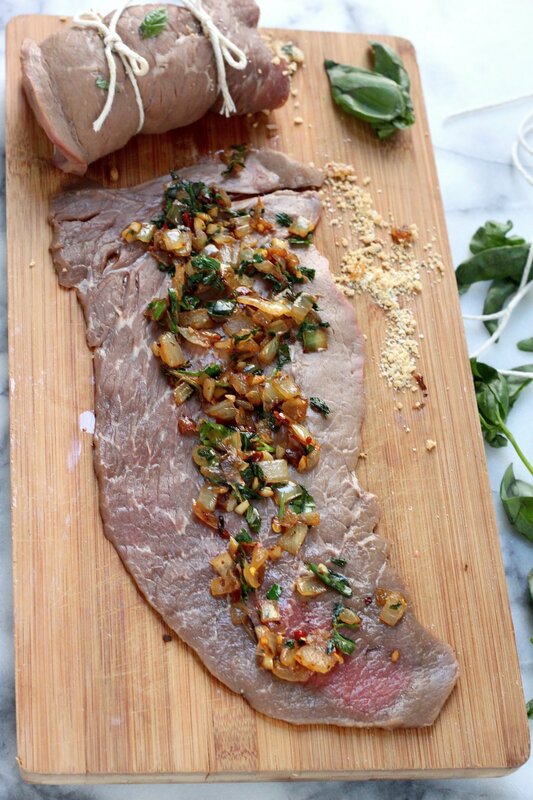 Lay the braciole flat on a large, clean work surface. Sprinkle the bread crumb/onion mixture evenly over the steak to cover the top evenly (if you're using multiple pieces of meat, divide the filling accordingly). Starting at 1 short end, and roll up the steak "jelly roll style" to enclose the filling completely. 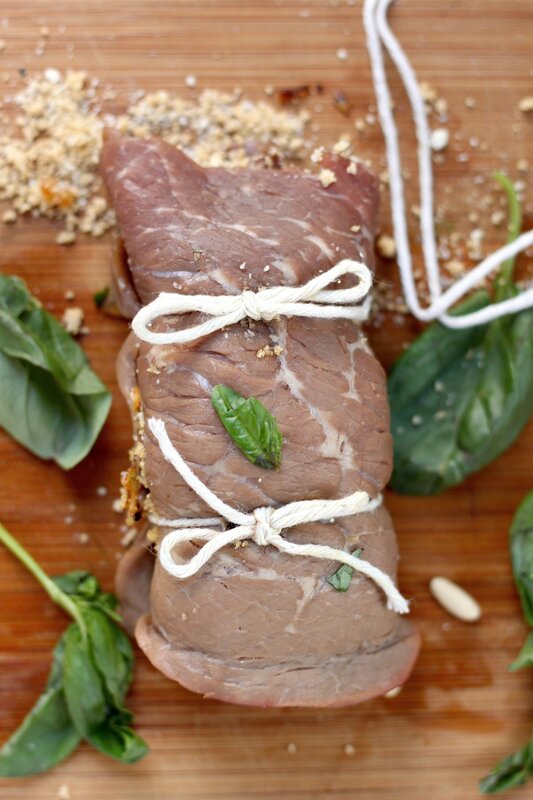 Using butcher's twine, tie the steak roll at the beginning, middle, and end to secure. Sprinkle both sides of the braciole with salt and pepper. Heat the remaining tablespoon of oil in a heavy large dutch oven over medium heat. Add the braciole and cook until browned on all sides and edges, about 6 minutes. Add the wine to the pan and bring to a boil; this should only take a minute or so. Stir in the marinara sauce. *When the meat has been cooking 3.5 hours, bring a large pot of salted water to boil. Add pasta and cook for 8-9 minutes, or until al dente. Drain pasta and transfer to a large serving platter or multiple plates. Top with lots of sauce and braciole. When ready to serve, remove the braciole from the sauce. Using a large sharp knife or kitchen shears, cut the twine off all rolls. Then, using a large sharp knife, cut the braciole crosswise and diagonally into thick slices. Transfer the slices to a large serving platter or on top of plates of pasta. Spoon the sauce generously over the meat and pasta and serve with cheese. How do you bookmark a recipe on Pinterest? Can’t wait to live vicariously through you guys on your trip! I hope you’ll share pictures! I just don’t make this enough and I should because it is that awesome. *sob* WHYYYY am I leeeeaving??! Whyyyy can’t I come over and eat this??! Seriously-amazing. So mad my grandma never made me this! Yumyumyerrrrm! Yay for Sunday suppers! This dish looks incredible, Ashley. I’m jealous you are going to Italy. But can’t wait to hear all about it! Sunday dinner is the best!! But this meal!! Gorgeous and delicious!! Sunday dinners are the best!! I know where to come for inspirations now. Although I am not sure I will be waiting all week for this…just saying. I married an Italian and this African is now a convert!! STOPP!!!!!!! this is so exciting about Italy, congrats Ash!!! what wonderful news, I am tres jealous! A Sicilian myself I have been to Italy, but never to Sicily, so please take three million pictures and share the experience with me, I can’t wait to see what you’ve got planned! I am officially craving pasta like mad! And I’m super envious that you’re going to Italy – it is on my list of places to visit! Hi! 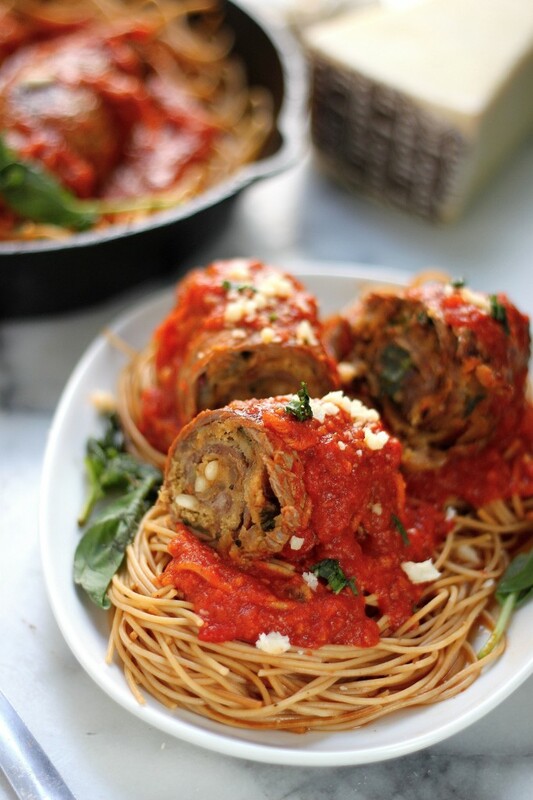 This looks amazing and I want to try it this week for dinner. I had one quick question, just to confirm. After you make the bread crumb, cheese, parsley, pine nut mixture and after you saute the onion, garlic, red pepper, and basil…do you combine the onion mixture with the bread crumb mixture for the filling or do you leave the onion mixture in the pan to brown the meat and be a part of the sauce? Thanks for clarifying! The most user unfriendly site I have EVER visited, and I was a Systems Analyst/Programmer for a Fortune 500 company! Hi Bill. Would you mind sharing your issues with the site? I’m making this for the second night in a row, my husband loved it that much! I’ll probably make it every weekend. I browned the meat in the morning, and threw it in the crock pot, so it’s super convenient that way. Hi Ariel. That is so awesome! And thank you for the tip on using the crock pot – I’ve got to try that! how many does this serve? Is each roll 1 1/2 lbs of steak? What am I supposed to do with the mixture in the skillet in step #2? Hi Aubrey. You combine it with the bread crumb mixture. 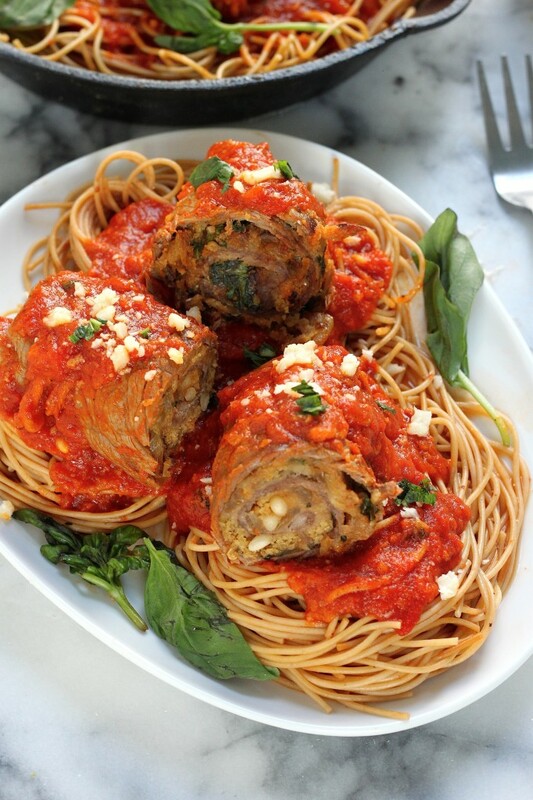 Very similar to our Sicilian braciole, although we use Romano, bread crumbs, garlic and parsley filling. I use grass fed beef and they cook faster. Nice post, beautiful pictures! I am Italian /American,not Sicilian,but I have been to Sicily! I make bracciole often. I love your recipe . Will be having my brother and his family this Sunday and we too will be eating pasta and bracciole! Isn’t Sicily amazing? I’m already planning our next trip back 🙂 Enjoy your family pasta night!!! I made this after my father mentioned it as a favorite in his childhood and how he wished his mom was still around to make it for him. Thought I would give it a try since I had never even had it before. Let me tell you it was a big hit. Brought back memories for my dad and he was impressed. My husband loved it and my daughter who doesn’t like meat very well raved about how the meat was the best part. I used the homemade marinara recipe in the link and it was fabulous as well. Thank you so much for sharing. I will definitely be making this again. How many servings are there in this recipe? I’m considering of using this for one of my projects for class. Can someone tell me how many servings in this recipe? I will say one roll for two people, generous portion. Is the meat raw before rolling? Cause it looks already cooked in the photo. Also can you omit the cheese? Could I add mushrooms or something place ? Is this a good meal to make ahead and reheat the next day, or is it best served fresh? My time is limited some days and I like to make some meals ahead. Can you make this ahead, slice and warm in sauce the next day? Yes, this is the stuff. Every Sunday we had this in our “Sunday Gravy” (I’m from NY). We also had pork and meatballs. I have been wanting to make it for so long. I have seen other recipes but this looks fairly simple. If you have already gone to Italy, I hope you enjoyed it. I went with my girlfriend probably 6 or 7 years ago, and it was the trip of a lifetime. I have been to many places but I promise Italy is the most beautiful country on the planet. We didn’t go to Sicily, I wish we would have gone south because my father’s father was from Bari. Anyway, make sure you try to take some of the side trips they offer from the hotels, Especially Pompei. I’ll let you know how my “Sunday Gravy’ turns out. Thanks for the recipe. I just noticed those dumplings too, look delicious!